Originally from Upstate New York, Katie Early as seen the world as her personal canvas to experience life and create the opportunities she envisions. With more than 25 countries checked off her list, she recently started a blog called Early Arrivals to document her musings. When she’s not jet setting around the globe, Katie runs a sales team out of Dublin, Ireland for the HubSpot EMEA headquarters. The move from Boston was a welcome one for her as she’s been able to use her new home base to learn how to work with other cultures both internally and externally. 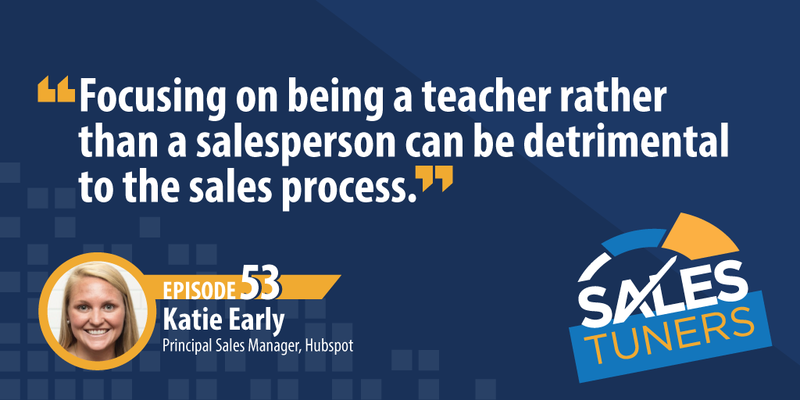 She expected to have to completely relearn a new sales process after her move from Boston, but Katie shared with me that the biggest difference was how people bought. It seems that in the States, companies are used to exploring new ideas and dreaming about a greater vision of the future. Across the pond, the buyer is rightfully skeptical and has a much more pragmatic approach to tools and systems. Katie works diligently to ensure her team understands her realization that we’re all just people, and if we treat each other as such while also breaking down our own hard outer shell, a lot more can be accomplished. Teaching Can be Detrimental: Spending too much time educating your prospect and not enough time selling opens up what I like to call the “friend zone” of sales. Sure your prospect likes you, but that’s because you’re providing them with free consulting. You have to understand this balance and get comfortable setting the right expectations in the sales process. Sometimes You Need to Get Burned: Sales is a contact sport. All the training and coaching in the world can’t prepare you for the first time you actually get hit. Spending time with a prospect, getting “happy ears” as Katie called it, only to have them go dark on you at the end is one of the biggest lessons you have to learn on your own. Moving Up Isn’t Always the Best: While I’m not yet an old man yelling “get off my lawn” to every passerby, I am one to tell you that skipping rungs on the ladder of success is not always the right choice. I’ve seen way too many people think “if I can just become the VP of whatever,” I’ll fix all the problems and everything will be better — only to burn out before getting there or be completely miserable once they do make it. Enjoy the journey and put more stock in that than on the destination itself.